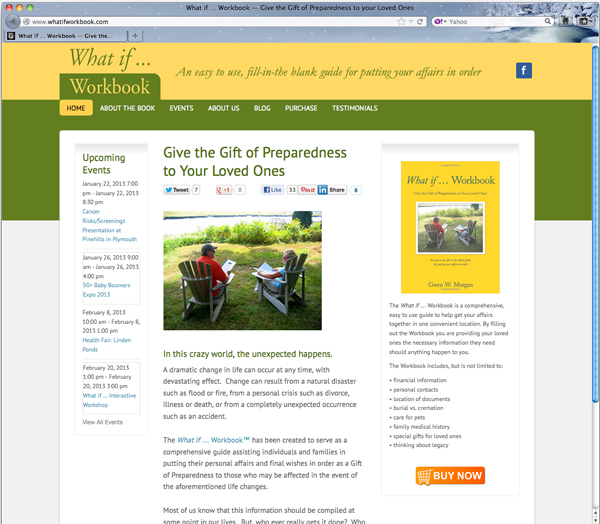 Gwen Morgan created the What if … Workbook™ a few years ago to serve as a comprehensive guide assisting individuals and families in putting their personal affairs and final wishes in order as a Gift of Preparedness to those who may be affected in the event of the aforementioned life changes. This is a GREAT resource for families, for those caring for aging parents, and more. We loved working with Gwen to bump her business up to the next level, creating a very professional, clean look for her products. And, she's wonderful about consistency, with the same look on her website, business cards, rack cards, brochures, email blasts, and FaceBook page. Entrepreneur selling a great resource needed to re-brand as business got bigger! Above showcases the new website, click here to see the old version.